The full art credit can be found in the program folder. That said, you can download Firefly there to go with Surprise. Ooh cool :3 I actually just started this, finished my first one of my OC this morning :D For now I just have trotting left and right and am working on an idle gif. Sooo yeah tips, tricks, critiques, advice, I'm all ears. I think he looks good. What botchan said and maybe give a little more time in between blinks for his idle. Good job. Even if your jsut doing that one frame, it looks very nice. Adam and Jamie, just in case your desktop needs more science. Somebody please help? i REALLY want to have my OC prance around on my desktop and do stuff with me, but i don't have the time or knowledge of photoshop and such to make her into a desktop pony. can someone PLEASE help me? Every part of that deserves a no. It's just a recolor and you can easily do that all by yourself. You don't need photoshop or anything fancy and you can find plenty of online guides explaining how to recolor an animation as well. Once you finish it, you can integrate it to Desktop Ponies by using the pony editor option, the rest is pretty much self explanatory. >>"This is meant to be a place to share, get critique, advice, ideas and is not meant to be a request thread for someone to make your OC"
Sorry if this wasn't the answer you expected, but it will be the only answer you will receive no matter how many times you ask. Nothing personal at all, it's just the default answer to any requests posted here. Since there is no definitive look for him, I am wondering what to do with him. Here is what I made so far. 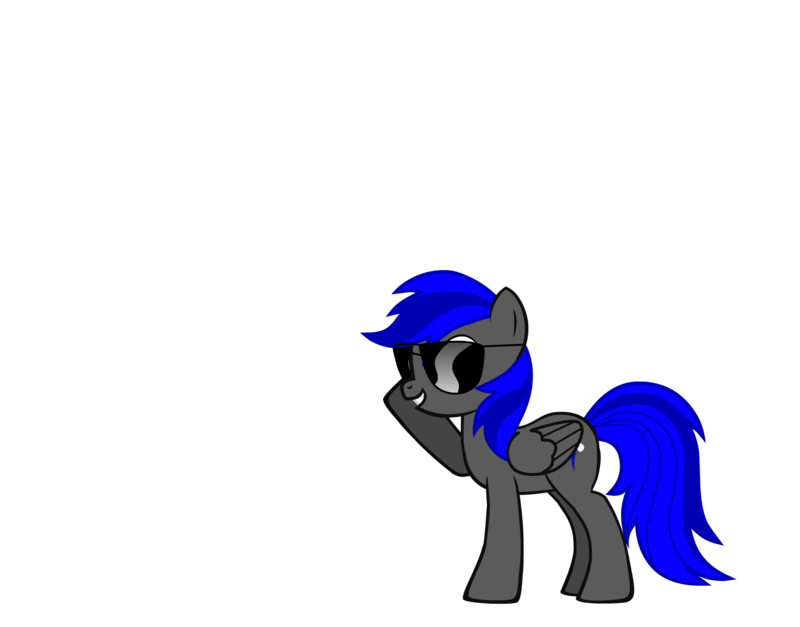 I'd like opinions on him before I start animating the trot cycle to see if there's anyway to improve his look. The hooves should be bigger. Bigger hooves? Those hooves look big enough to me. If he's supposed to be a robot or just wearing heavy armor, then the hooves should be bigger and more defined instead of being a mere continuation of the legs. I think it looks fine. Make the legs too much bigger, they'll look more like logs than legs. Not even armored ponies would have legs quite that thick, at least not if they're going to be able to walk. add a joint to the legs were the knee would approx be I think? 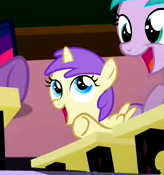 A toy only pony who never appeared in the show, despite having a unique vector. I really love her mane! Aw,I was gonna do her.Well,she does look exactly how I was going to do her. 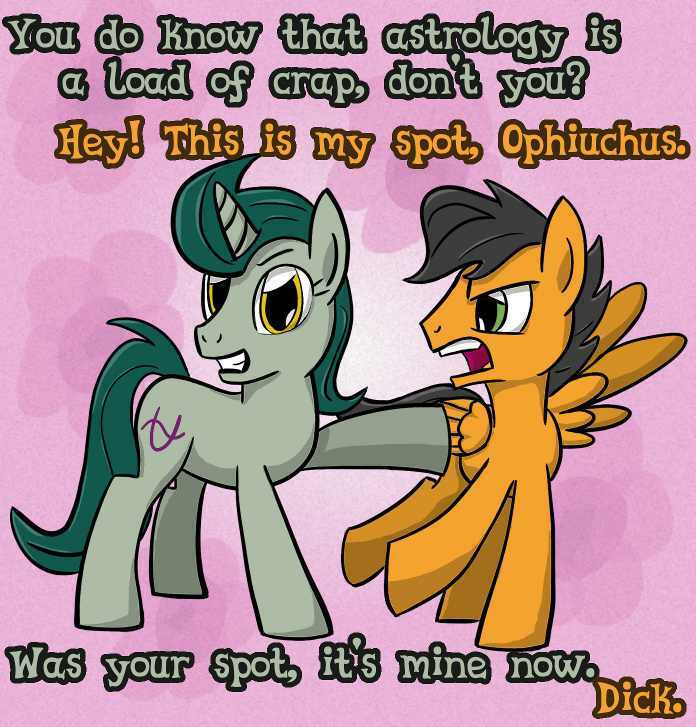 So you are not doing Ophiuchus? Nope. I was thinking about making one, but then I decided to stick to the "official" Zodiac Ponies. Yeah, I too wondered if she was going to have an important part in the show, at least in one episode, but no. Very mysterious indeed. Oh, and one more thing... Sooooooo glad the new version is out. HOORAY! Hopefully it will not be a recolor or a static Flash image made with the Pony creator? You can see right now. I've been working on it since around 10:00 today (eastern time) and I'm still trying to finish it. As you can tell the cutie mark is simple, but even I don't think three dots will be enough. Anyway, I'd better search on Google to get a few pictures of Sephiroth so I can put more details on this OC. Please don't take this personally, but how old are you? Eleven? The way as you talk and the things you do make me think you must be very, very young. Here's left. Note that the wing goes behind him on left. That's because he only has one wing. I think. And here's the right side. The wing is now in front because, like I said, he only has one wing. That doesn't look like Sephiroth at all and why is that wing blue? Looks like you were really desperate to finish everything as fgast as you could and you never bothered to really pay attention to what you were doing. Among other things, the mane and the tail look like pieces of cardboard and they don't resemble Sephiroth's hairstyle at all. Try again, do it SLOWLY and finish one pose before rushing to make four at once. I'm totally lost here. I've never been able to do things right... I always mess up even in my everyday life. Cut down the drama, please. If you always mess things up, then that's your problem and not a blanket excuse. Don't post any other image here until you practice and especially, pay attention to the things you do. Making a single crappy pony can be understood but when you spam a lot of animations at once makes you look like you are paraspriting this thread on purpose by flooding it with horrible stuff. I told you I was a beginner... besides, it was still a work in progress. I should have told you guys. If you want me to keep going just say it, but if you don't, just make sure that you don't screw me. Mainly because I already screwed myself. I had to start the whole thing over from scratch. If I went wrong somewhere on here just let me know and I'll fix it. That's not something made you from "scratch", you simply took one of Bot-Chan's ponies (Flim to be exact) and recolored it in black. I made the tall stallion template public, so he's probably using that. It's okay. No I didn't. I used this template included with the OC Ponies download. Look in the zipped "Templates" folder if you want proof. This is one of two pictures I am using for reference while I do my OC. This one's the front view. And here's the back view. 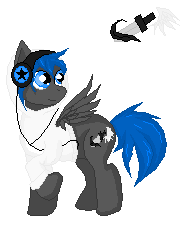 This picture shows the wing as blue, so I incorporated that into my OC. Wow, now THIS looks pretty. 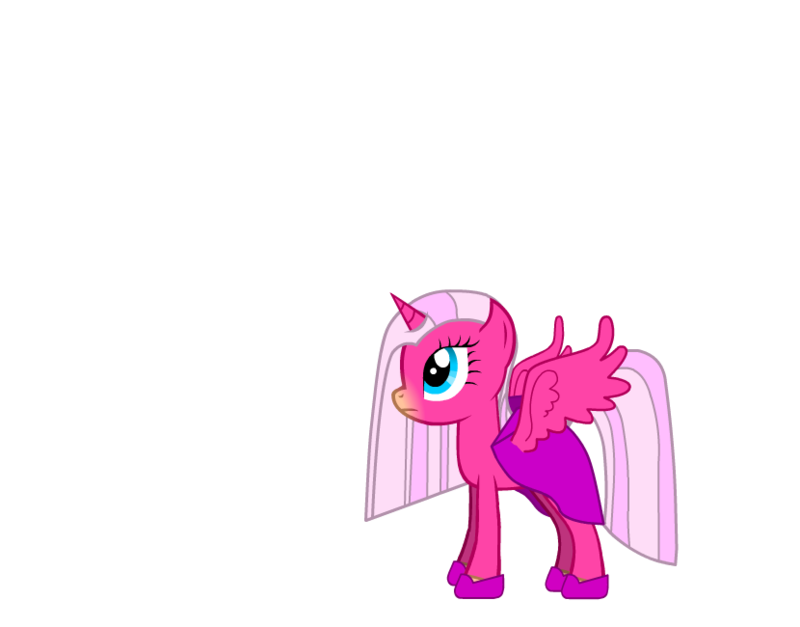 Okay... so I pretty much made a few fixes on Sephiroth pony. For one, I added the bangs (or whatever the heck they're called) and tried my best to make it really look like Sephiroth. I also made the wing folded and not spread. Any tips, suggestions, or whatever will be accepted and, if there is something wrong, I'll fix it again. Also, although the black coat is supposed to evoke the black of his leather outfit, it simply doesn't work here because, as far as colors go, fans are more likely to think of his silver hair first. Maybe add grey shoulder pads and other hints of his armor or something? Adding Masamune would help tremendously as well. Also, although his hair looks a little bit closer to the weird thing his bangs do in this newer iteration, it's not quite there yet. Make it defy gravity even more. Oh wait, you made Masamune his cutie mark. I think it would make a better appearance as an actual sword, but that's okay too. Also, if you are going with his black/blue wing from KH, make the blue darker than that. As it is, it looks kind of out of place. That pony's muzzle doesn't evoke Seph at all. 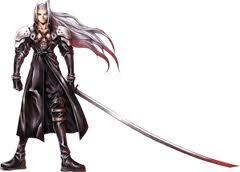 In fact, there's nothing Sephiroth-like on that pony, period. I didn't see that on the picture I used. Either the picture is biased or I need glasses. I guess I DO need glasses. >I guess I DO need glasses. What you really need is stop rushing things and actually pay attention to what you do before posting it here. After all, this is not a race and neither is a quest to get some E-attention. That one does look better with that added hair but the rest of hair doesnt really invoke the look of him. You have the other part of the mane as a straight blocky haircut when his hair looks more wild and would be more spread out. Id have his tail be a little more winding in its look too. If you are going to have the wing, I would probably have it be open and have it have it be tri color (dark at the base to a lighter blue at the tips)to create that effect that I see in his pictures. I think princess luna's wing would work best. It might work if you use princess cadence's folded wing cause his wing is always seen as huge and the regular pony wing is just too small. Oh she is pretty. That frosted look is very cute. Are you going to animate her? Between everything else I have to draw, I managed to make /mlp/'s New Princess, Princess Erroria. and you forget transparency in one pixel in the wing pose in the tail, or is intentional?? The character itself may be canon, the constant glitching however is not. I guess this really is one of those special cases, much like the infamous cyclops pony or Princess Swanlestia. haha that is pretty clever. Nice job. Its the fannon attributes that make her fit in here. If it was just a regular walk cycle etc, then yeah she would go in the regular program. Here she is doing the cute glitchy thing which is not canon. 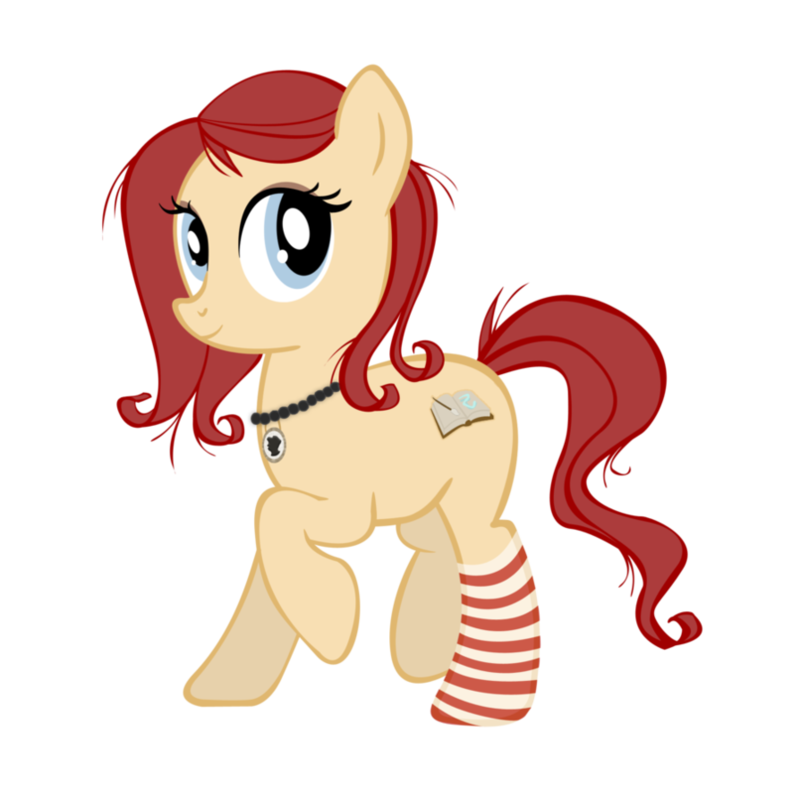 Therefore she fits in the OC Desktop Ponies. Remember that this is not just for OC ponies but fannon, pre g4 ponies and the like. 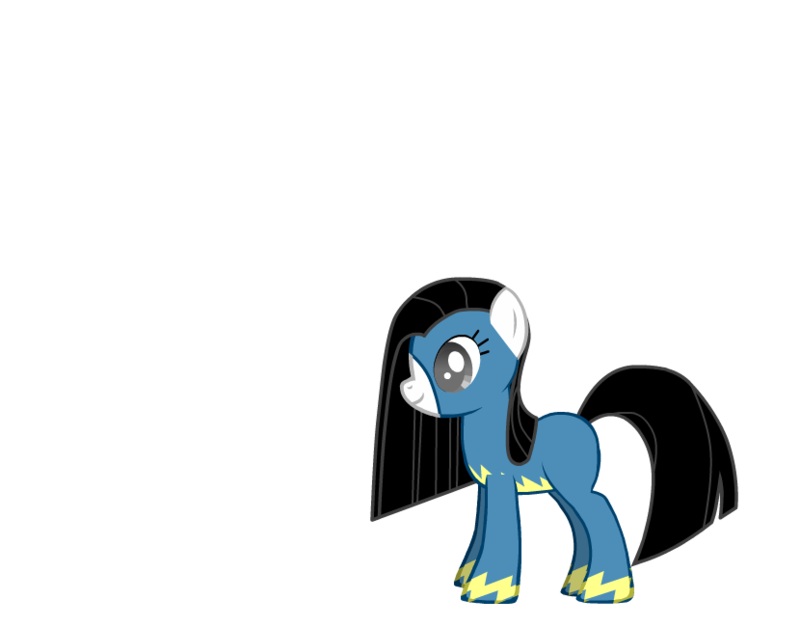 I tried to make her the 404 causing, glicthy pony that the bronies on /mlp/ ,made her. Which is why I stuck her in here. Have the Browser OC ponies been made into desktop ponies yet? **EDIT: Herp Derp, sorry about that. Just saw the note at the top. I put him in there. Since there's so many ponies now it may be a little harder to find him but he's there. Thanks again for making him. He is a pretty cool design. I've only put in people's OC's who have requested they go in the program. If you get the gif files from the artists you can easily add their ponies to your desktop ponies program. Just use the pony editor or copy an existing pony.ini file and edit that to get them running in yours. Plus, everyone love some good spaghetti now and then. A wip for now as the original pic I wanted to adapt was too gangly for this scale. Well, finally got enough willpower to add the tiny finishing touches, hahaha. First version of The Weaver's Danganya for Desktop Ponies, so she could follow Ice Pack around to creep him out. This isn't a request thread. Sorry, but you're in the wrong place for that. And that OC is horrible, to boot. I dabble in these things every so often so have my two contributions. I'm just gonna post the DA links here since the main Desktop Ponies site wont load for me for some reason. Let me know on DA if you spot something weird or whatnot happening with them like a messed up animation or such. I'll do my best to check up on here but no guarantees. Still can't access the site so here I am posting my latest work. Button's mom from the Buttons Adventures animation. PS If you spot anything wrong note me on DA Thanks! did not mean to post as reply to this thred and now i can't delete it...sorry!! 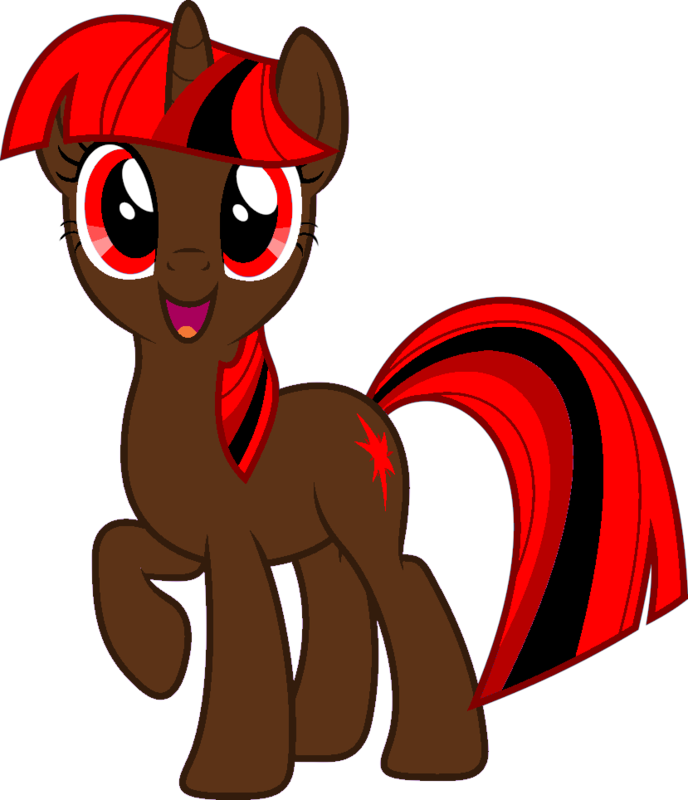 Can you make my oc for Desktop ponies ? How about if you read the first post that's right on front of your eyes? "This is meant to be a place to share, get critique, advice, ideas and is not meant to be a request thread for someone to make your OC"
Originally made by ponyNoia; I wanted to see if I could add a couple of things on my own. No matter how much I fix it, it seems that her head keeps duplicating... Any advice? They're all set to "Do not dispose", which is the only thing there besides "Dispose" and "Automatic". It's fixed! Thanks so much! First attempt using DP base so I made my OC Brightburn. G3 may not be the most popular MLP generation, but some of the character designs wouldn't look so bad in a G4 style. Nice job. For some critique I'd say the front blond lock bounces a little too much but I do like how it matches the bounce in the back. It looks like you changed the stock eyes too. Nice work they look good. Gives him kind of a suave debonair demeanor. One thing is the bottom of the tail looks so flat since you have a whole bunch of pixels in a straight line. Changing just a few so they are not all in a row I think would help it just a bit. All in all a great job. Thanks for sharing. I agree, it is fun seeing the g3 heck any previous generations of pony in g4 form. Toola-Roola I think was one of the more likeable ponies from that generation. Not as cool as minty in her socks but the beret works for her. Nice work. If you look at the first 2 paragraphs, you will see this is not a request thread. There are guides to help you try and make your own and you can ask for advice and critique here but we will not be making your OC for you. How long has it been since this was updated? If the first post of this topic is any indication, it's been more than a year since the last update. Oh geeze, would it be best to build a pony for this version of Desktop Pony Ocs, or use the more updated normal Desktop Ponies version? Well, there's hardly any difference in creating them and the ponies would have to be added to the main program either way. Ponies made for older versions of the program are still compatible with the new versions for the most part, they just don't make use of some of the newer features. But I tried using Ponies from this Version in the Official release. Some of them just made it crash. Gosh I didn't realize it has been that long. I know a few things were changed in the way ponies work in the newer desktop pony version so I will try to go through and make sure they all work in that. I had to do the same when I made this version which required changing about 20 ponies that had various glitches. 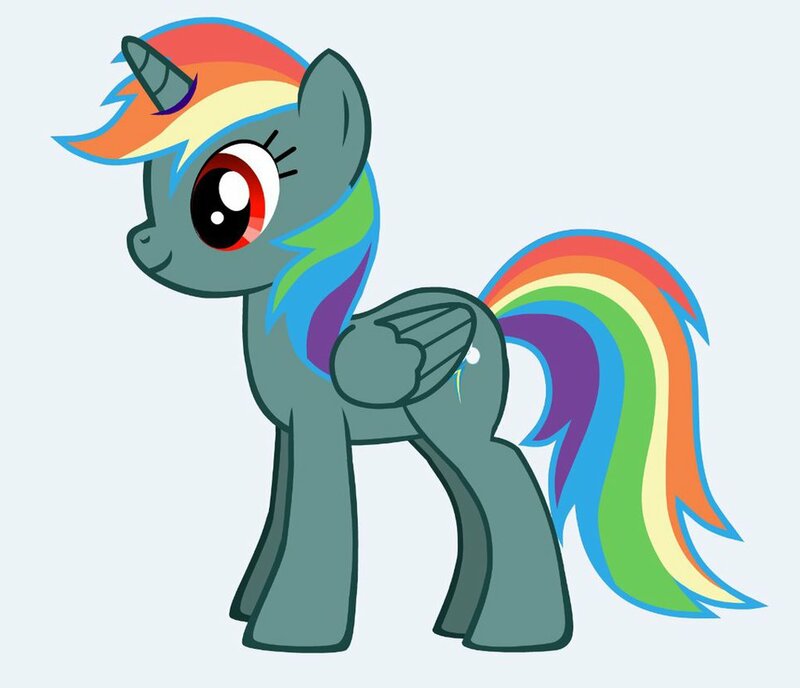 Make the pony.ini for the newest version as that's what you should be using. There is not that much difference but better to keep current. Ok I just tested the ponies out and none made the program crash. It might be that I tried out the ones I had in my version 1.03 folder but I don't think I had to change any besides a few where the speed of the gifs were set wrong but that wouldn't cause any crashes anyway. What ones made it crash if you remember? so yea who about thing Colt? can you guys make him please? you can remove the white hoodie but not the headphones please... but i would be happier if you guys added the hoodie or do both. I would like to know the meaning of these parameters in the pony.ini file. May already have the manual, but I can't find it. Oh, sorry, I forgat,that there is Pony Editor. Hello, I'm missing something. I have an OC and I dragged the folder into the Pony Data directory per the instructions. The folder shows up in the directory but the OC doesn't how up in the main menu to be selected. There could be something wrong with the pony's code, but it's hard to tell without knowing the content of your OC's folder. Do you maybe have a download of that OC so I could take a look? Thanks for the reply. I Just figured out what was up. For reference, I'm using Xubuntu 14.04 and I believe the latest run of QT Ponies for Linux. When I dragged the OC folder into the main pony folder the permissions changed and “locked out” all the contents of the OC folder. The fix was to change the permissions (I used Nautilus as root) and give “root” read only instead of none. 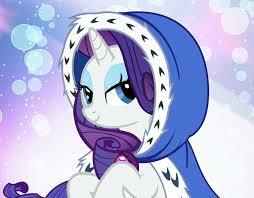 Hey, I'm a fan of MLP like probably anyone that contacts you. And my OC's name is Master Silvertongue. This is a link to his bio and the like. I hope that you will consider adding him. But if you dont I understand. There seems to be a distinct lack of a downloadable desktop pony on that page, so even if the OC pack gets updated sometime in the distant future, how are we supposed to add something that doesn't exist? yo, I know I'm not suppose to ask for requests, but would anyone be interested in going a trade?